A complete Social Relationship Platform (SRP) partner provides a unified platform for engaging audiences, activating customers, and driving business results across all social channels. Does your current Social Relationship Platform allow your organization to accomplish all of these things? 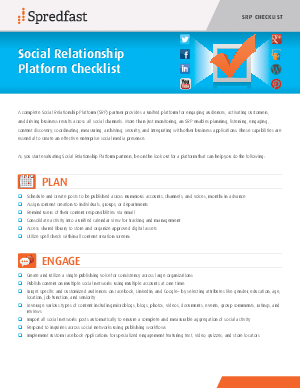 Download this checklist to see the strength of your SRP and to see if there are ways to vastly improve it to increase your social media presence.